Former British prime minister David Cameron today defended his decision to call the referendum on whether the UK should stay or leave the European Union. KIEV: Former British prime minister David Cameron today defended his decision to call the referendum on whether the UK should stay or leave the European Union, as London formally launched the process to quit the bloc. "I thought it right to hold the referendum because this issue had been poisoning British politics for years. The referendum had been promised and not held," he said during a visit to Ukraine. "I made a promise to hold a referendum, I think it was the right thing to do," said the Conservative ex-premier, who called the referendum. "We held the referendum and, of course, the result is not the result that I sought," Cameron, who led the campaign to stay in and announced his resignation a day after the referendum, said. "But it was a decisive result and that's why today Theresa May quite rightly is taking the next step to ensuring the people's will is followed through," he added. Today, Cameron's successor May launched the process to leave the EU, formally notifying the bloc via a letter to EU President Donald Tusk. 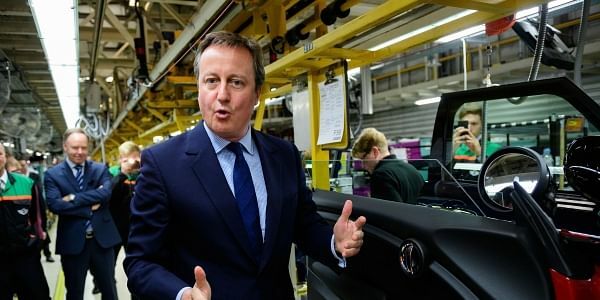 "I hope we will be out of the European Union, but we will take part in security cooperation and other forms of cooperation to recognise that while we are leaving the European Union, we are not leaving Europe, we are not giving up on European values," Cameron said. "Britain was always rather reluctant and uncertain member of the EU," he said. "We were in the EU for reasons of utility rather than emotion. We were there for the trade, we were there for the cooperation and I thought it right to stay because I wanted more trade and more cooperation." "But nonetheless the other side... won a vote and we need to go ahead with Brexit."